It’s been a long time since I’ve been able to do any kind of serious hobby update on my blog, principally as my degree has been taking over the world since January. My final essay was in last week, and while I still have an exam on 2 June, I’m otherwise done now! So there shall be revising going on for the next few weeks, but I feel like I have a lot more time back, and so I’m obviously spending that time painting little people! 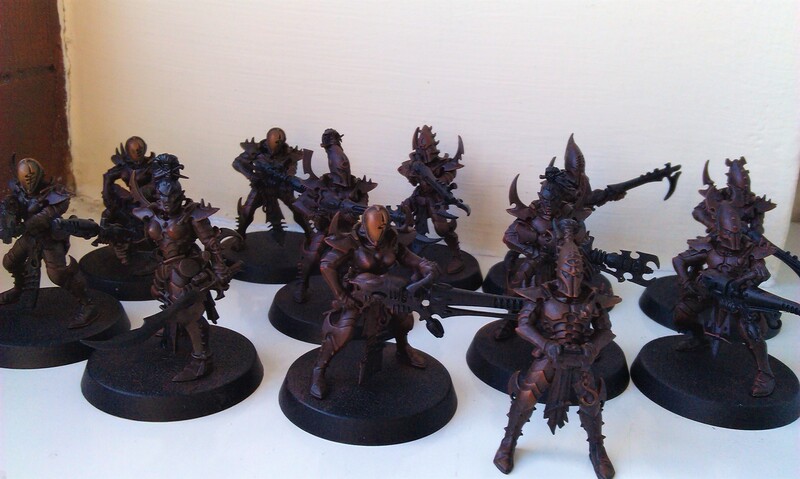 Dark Eldar are obviously still high on my list to get done, mainly I’m planning to get a force ready in time for playing some 8th Edition from as soon as possible. I’ve still only gotten one actual unit of Kabalite Warriors finished, but these guys are well on the way, so I’m hoping I can turn them around quickly enough. Something that I’m finding to be quite the chore right now is getting round to doing the vehicles for these guys, as well. Of all the miniatures involved in the game, I think I prefer doing infantry the most, and vehicles are just too much like hard work. I’ve currently got three venoms and a raider just hanging about waiting for me to do stuff with, but I find it very difficult to want to do stuff with them. If Dark Eldar retain their flavour of a vehicle-heavy army in the new edition, I might have to up my game here – or at least, find an easier way of doing them!! 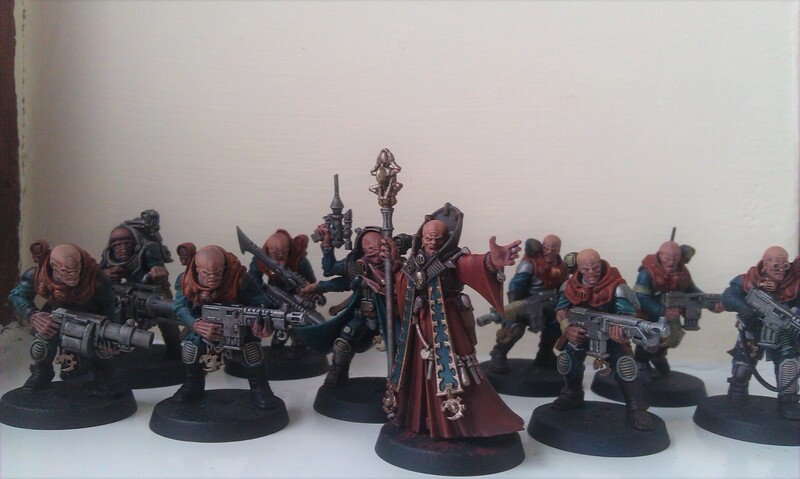 I’ve also been painting Genestealer Cultists! These guys were done around Easter, as it happens, and while they still aren’t finished, I think they look pretty great as a start to my forces there. While I definitely enjoyed doing all of these little chaps, I think they were too much like a distraction for me, as I’d been wanting to get back into painting something since struggling to get anywhere with my Wracks earlier in the month, so now that I’m better-predisposed to it, I’m moving back towards the armies that I actually want to play with, rather than those I want to paint. Don’t get me wrong, I’m looking forward to eventually getting the cultists out there as well, but for now, I’m all about the Dark Eldar and the Necrons! Yes, that’s right, I’ve resumed painting my undead space robots! I’ve actually made hardly any progress with these guys yet, of course, but I stripped a bunch of Lychguard at the beginning of the year and had them just hanging about since, so I’ve been wanting to get going with them – again, mainly because I want to have some dudes ready to go with 8th. My Necrons are easily the most numerous force I have, so if I can get a few more done between now and then, I’ll be happy. If 8th Edition gives back the rule to allow the dispersion shield to bounce hits back at the shooters, then I’ll be even more happy! While I’ve been really quiet as regards the painting side of things, I most certainly haven’t been as far as building minis goes! First of all, I built up a Dark Artisan formation, getting it built scant weeks before the announcement came that formations are a thing of the past! I do hold out hope there will be several thematic formations like this, of course, but it’s a little sad that something fairly iconic that I was looking at has now gone. I’ll still be fielding them though! In the midst of all the angst over 8th, Shadow War really seems to have hit it off – it’s almost like GW planned to have an awesome alternative to play while the new edition was being prepped for launch! My local store was running an Armageddathon on 1 May (Mayday! Mayday! ), which I eventually couldn’t be a part of as I went on a date, but I had prepared a force of Harlequins in the meantime! So it’s 1000 points in Shadow War terms, and I still plan to do something with them soon. I’m definitely not going to do Masque of the Midnight Sorrow diamonds, as that way lies madness, but instead I’m planning to do them themed as DC villains. This instagram post explains it a bit more, but basically they’re being led by Deathstroke. Stay tuned to see how that turns out!